For our summer trip to Rome last month, I bought a ultra wide angle lens (20-35mm) from eBay for my Canon DSLR. But then at last minute I decided to travel light so I didn't take it with me to Rome. It is not until just a few minutes ago that I took the first photos using that lens after having it for over 3 months! 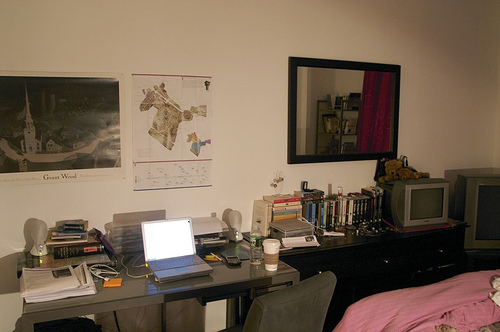 You see, ever since Leah and I lived together all those years ago she had never has a desk of her own. I always have a desk so it is a pretty new thing for her to have her own. So when she had finally finished 'pimping' her desk out she naturally wanted some photos to show off. I am sure she would tell you all more about her new desk. Me, I am just the photographer so enjoy! July 18, 2006 - 12:56 pm Leah H.